December 15, 2010 - To all Key Shipmates - May you have a healthy and happy holiday season. Visit the Key store for great Key gifts. I use my Key coffee cup every day. December 5, 2010 46 years ago today the Key's keel was laid down in Groton. November 2010 - New Key shipmates added in November 2010. Johnson, Larry 77 - 79. Check Crew List for details. November 25, 2010 - Happy Thanksgiving to all former Key shipmates. October 2010 - New Key Shipmates added in October 2010. Locklear, Michael 89 - 92; Strong, John 68 - 71; Merkey, Ken Plank Owner 65 - 67; Lawrence, Steven 91 - Decom. Check Crew List for details. 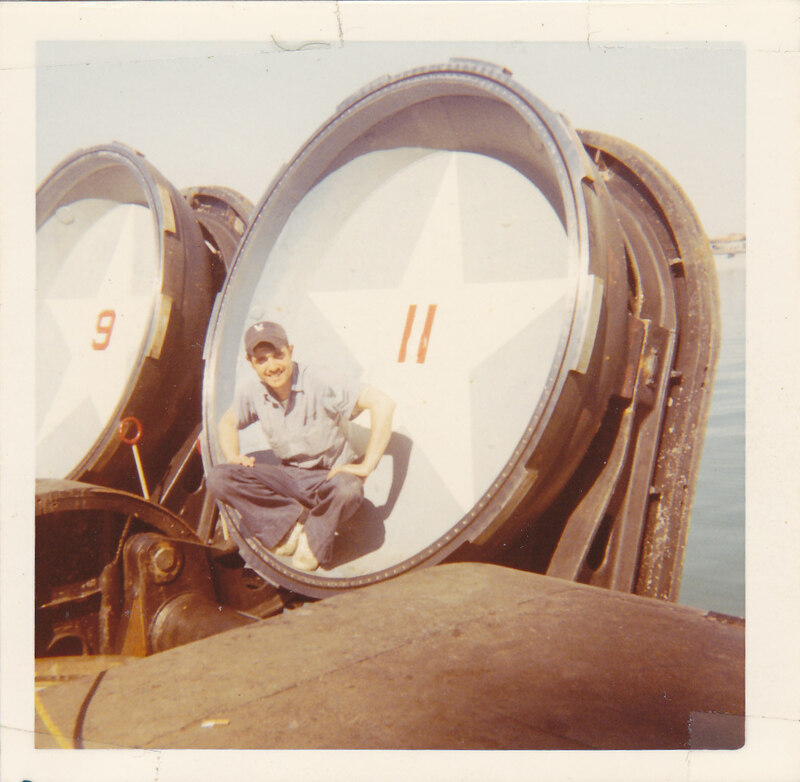 The first picture is of Tom sitting in the hatch of Tube 11 in 1970. The second photo is a picture of the Key in floating dry dock in Holy Loch in 1970. September 2010 - New Key Shipmates added in September 2010. Smith, Troy 88 - 91; Bishop, Tim 76 - 80; Tengelin, Harold 77 - 80. Check Crew List for details. August 2010 - New Key Shipmates added in August 2010. Smith, Christopher 89 - 92; Hamblin, Terry 67 - 72; Daugherty, Bill 8 - 90; Petrie, Daniel 83 - 88. See Crew List for details. August 23, 2010 - Terry Hamblin 67 - 72 Gold RC -Div has written a blog about his days on the Key. You can read it by clicking here: http://terryshere.wordpress.com/ I have made a link to this blog under his name on the Crew List. If any of you guys have a blog, Facebook page, etc that you would like to have linked to your Crew List entry just send the link along to me and I'll make the connection. That way a shipmate could click on your name on the Crew List and go to your page. Aug 23, 2010 - Anyone have any new pictures to send in? It has been a while since we have received any new pictures so dig through those dusty boxes, scan those Polaroids and e-mail them to ssbn657@comcast.net. July 2010 - New Key Shipmates added in July 2010. Kimber, John 86 - 88; Harris, Larry 89 - 92; Howell, Charles 68 - 71; Oetting, Wayne 80 - 84; Lyon, David - Plank Owner 65 - 67 & 71 - 75; Hotstream, Roy 74 - 77; Casey, Christopher 89 - 92. Check Crew List for details. July 12, 2010 - I just received the below e-mail notifying us of the passing of David Lyon III, FTG Plank Owner who rode the Key twice in his career from 1965 - 1967 & 1971 - 1975, the last years of which he served as COB. Our sympathies go out to Dave's family and friends. Here is the message from Dave's son. "My father was a plank owner from his first time around on the Key and COB on his last. His name is David Lyon III he was a FTG. He died in December of 2008. He reported to the Precom crew in Nov 1965 to the blue crew. He made 2 patrols before being transferred to shore duty. 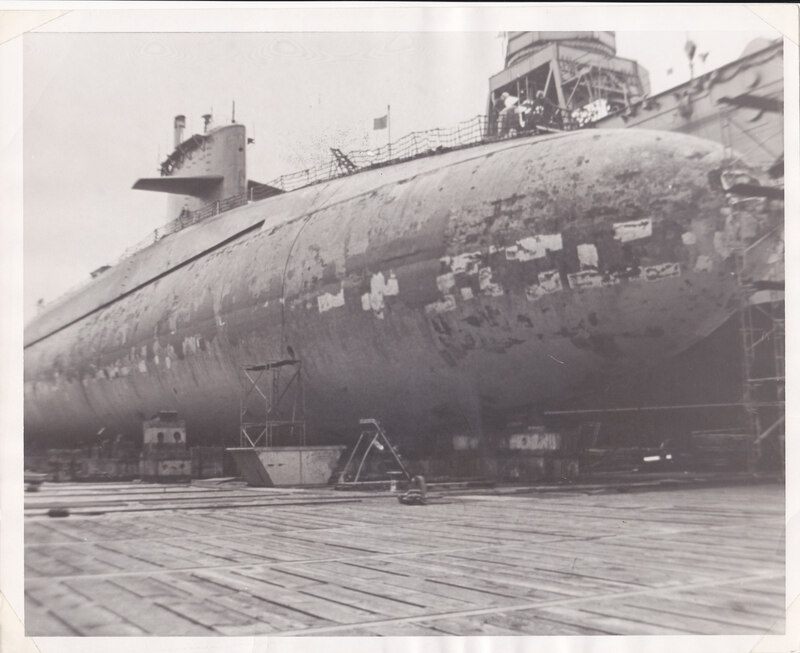 He re-reported to the Blue crew in Sept 1971, made 1 patrol and was transferred to Bremerton for C3 conversion. He took the boat to Charleston where he made 2 or 3 more patrols on the blue crew and was COB late 74 to Apr 75 (I think). I remember Capt Bump as well as several other former crew members. If you could add him to your crew list I would appreciate it. David Lyon IV MMCS(SS) Ret"
July 5, 2010 - Two new T-shirts added to the Key Ship's Store: Key Boomer Pride Runs Deep and Key Brother of the Phin. Click on Ship's Store to see them. Great for the summer. July 4, 2010 - Scroll down to see the current Key Images. June 2010 - New Key shipmates added in June 2010. Cauley, Richard 86 - 88; Hendrix, Calvin 84 - 88. Check Crew List for details. June 15, 2010 - Scroll down to see a great picture of an aircraft carrier and submarine passing each other in Norfolk harbor. It was nice of them to do this this for our reunion photo. June 4, 2010 - Just received news of the passing of HMC(SS) Robert "Link" Lindquist on June 1, 2010. Robert served on the Key Blue Crew from 1977 - 1978. Robert served 30 years in the navy. His obituary can be found in the Eternal Patrol area. Our deepest sympathies go out to Robert's family and friends - and his many, many shipmates. Robert rest your oar, Job well done. If anyone has memories or pictures of Robert, please send them in to be added to his memorial page. May 2010 - New Key shipmates added in May 2010. Rosinko, Louis 87 - 90; Maetke, Michael 69 - 72; Woodhouse, Gene 71 - 74. Check crew list for details. May 25, 2010 - The 2010 Key reunion was a great success. The tours of Dam Neck and Norfolk bases were first rate and the tour of the USS Scranton was the tour high point. We would like to publicly thank the crew of the Scranton for their hospitality in putting up with all of us during their refit. The next reunion will be in 2012 at a location to be determined but Portsmouth, NH and Charleston SC were mentioned as possible sites. The 2014 reunion will be held in the Baltimore area in conjunction with that cities celebration of the 200th anniversary of Francis Scott Key's penning of the Star Spangled Banner. May 11, 2010 - Final reunion attendee list. Click here to check them out: Reunion 2010. See you next week in Norfolk. April 2010 - New Key shipmates added in April 2010. Krugh, Mike 87 - 90, Kirk, Jeff 85 - 88; Restivo, Jeff 74 - 78; Graham, Hugh 75 - 79. Check crew list for details. I hate to be the bearer of bad news, but Jeff Restivo died, February 26, 2010. Jeff had had some chest pains at work, was taken to the hospital where they decided to do a bypass operation. He never really woke up from the surgery and died 7 days later. Jeff was a good man, a great friend and a great A-ganger. After Jeff left the Navy, he became a great husband to Janet and a great father to three daughters. All of the Key family sends our heartfelt sympathies to Jeff's family and command Jeff to rest his oars - job well done. March 2010 - New Key shipmates added in March 2010. Sekinger, Allen 89 - 92; Wendt, Gil 69 - 72; Brinson, Carl 85 - 90; Walker, Rich 75 - 79; Bazemore, Connie 75 - 79; Petersen, Thomas 77 - 81; Mueller, Eugene 80 - 86; Padovano, Frank; Hooks, George Plank Owner; Griffith, Allen 78 - 80 & 86 - 89 . Check crew list for details. Al & I were in Norfolk last week & stayed at the Lake Wright Quality Suites ( one of the host hotels for our reunion ). The facilities are great. The Hot breakfast buffet was good & they have a limited menu for dinner at the hotel. However, if you don't want dinner at the hotel, there are plenty of great restaurants within a short distance. They do no serve lunch on the premises, however they have a small store within the lobby. Here you can buy frozen meals, deli salads & sandwiches that are fresh daily, cup of soup, mac & cheese & plenty of other choices to cook in a microwave. If you are in the Sleep Inn without the microwave in your room, there is a room off the lobby with one you can use. It also has a coffee pot with on demand coffee that is available all day & night. If you plan to attend the trips on Fri or Sat, I have to give a preliminary count to the tour group by April 9th, so that they can arrange for the size bus that we need. Final counts are due three weeks prior to the reunion, April 30, 2010, at which time I will get an invoice. Final and full payment due is upon receipt of invoice. No refunds will be issued after I pay the invoice. Anyone who does not show for their tour will not be refunded their money. Last minute sign ups will be accommodated on a space-available basis only, and ticket prices on site will be an additional $3.00 per person Therefore, if you are planning to come to the reunion & go on the trips, I need to know ASAP. March 5, 2010 - Ron Larsen FTB1 69 - 71 Gold crew informed me today of the passing of Gilbert Wendt FTB1 - Gold Crew 69 - 72 back in March 17, 2007. Gil's obituary has been added to the Eternal Patrol page. 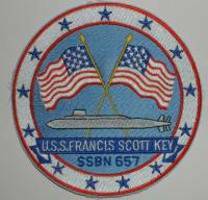 Any shipmates of Gil's that would like to add comments to his memorial area please send them to ssbn657@comcast.net. Rest your oars shipmate - Job well done. March 3, 2010 - Received this e-mail from Len Reneau COB 77 - 80 Gold - "The 200th anniversary of the battle at Fort McHenry in Baltimore will be on the 13th and 14th of Sept 2014. It was at this battle that inspired Francis Scott Key to write his famous poem. I will be there, I hope the rest of the crew will be there also, in a grand reunion." What a great idea. Let's plan on having as many Key shipmates there as possible. We have 4 years to plan. March 3, 2010 Details are now available for the May 2010 Key Reunion in Norfolk, VA. Click here for full information. February 2010 - New Key shipmates added in February 2010. Welch, Michael 90 - 92; Ford, Jim 78 - 81; Storms, Richard 69 - 72. Check crew list for details. Just a reminder that our reunion is fast approaching - just 3 1/2 months away. Don't forget to send me your registration & book your room at the motel by April 20th ( just 10 weeks from now ). I have been informed that the Sub Tour on Sat. of our reunion will be limited to 40 people. We will probably be touring a Virginia Class or 688 Class sub. Therefore, the first 40 to sign up for this trip will go on the Sub ( Feb 25th update - 31 have signed up to date ). Everything else that day will be the same for those who sign up, but don't get to tour the sub: tour the base, lunch on the base, riding Norfolk tour & Victory Rover Harbor Cruise. If you sign up for this trip & don't want to go on the sub tour, let me know, so that there will be room for those that want to go. Another thing - I do not need the last 4 digits of your Social Security number - all that is needed is a photo id. One other thing - you will need to be in good physical condition & be able to go up & down stairs & be able to get through the boat hatch. anuary 2010 New Key shipmates added in January 2010. Hicks, Jack 79 - 83; Kuykendall, Richard Plank Owner 67 - 72; King, Jonathan 87 - 89; Rose, George Plank Owner 65 - 69; Mericle, David 81 - 85. Farren, John 69 - 74; Whisenant, Barrie 81 - 88; Chapman, Dean 80 - 81. Check crew list for details. January 20, 2010 - We have just created a list of those who are planning to attend the 2010 Key Reunion in Norfolk, VA. If you are thinking of attending, please let us know so you can be added to the list. We have a "Probable" and "Definite" column. Click here to see the listing: Reunion 2010 Attendees. For the 2008 reunion in New London, we had 70 shipmates attending. We would like to break 100 this year so hitch-hike, carpool, bike, drive, fly or swim - you will have a good time. January 10, 2010 - Details are now available for the May 2010 Key Reunion in Norfolk, VA. Click here for full information.